AUSTIN, Texas — A federal judge late Wednesday temporarily blocked most of Texas' tough new "sanctuary cities" law that would have allowed police to inquire about people's immigration status during routine interactions such as traffic stops. The law, SB 4, had been cheered by President Donald Trump's administration but decried by immigrants' rights groups who say it could force anyone who looks like they might be in the country illegally to "show papers." The measure sailed through the Republican-controlled Legislature despite months of protests and opposition from business groups who worried that it could cause a labor-force shortage in industries such as construction. Opponents sued, arguing it violated the U.S. Constitution, and U.S. District Judge Orlando Garcia's ruling in San Antonio keeps it from taking effect as planned Friday — allowing the case time to proceed. In a 94-page ruling, Garcia wrote that there "is overwhelming evidence by local officials, including local law enforcement, that SB 4 will erode public trust and make many communities and neighborhoods less safe" and that "localities will suffer adverse economic consequences which, in turn, will harm the state of Texas." "The Court cannot and does not second guess the Legislature," he continued. "However, the state may not exercise its authority in a manner that violates the United States Constitution." 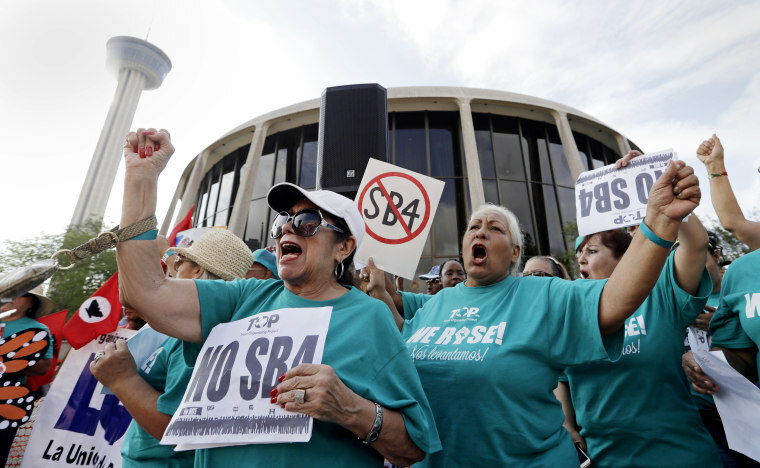 The four largest cities in Texas — San Antonio, Austin, Houston and Dallas— have joined the lawsuit, saying the law is vague and would have a chilling effect on immigrant communities. Their attorneys told Garcia that his ruling could determine if other states pursue copycat measures. Lawyers for the Texas attorney general's office responded that the new law has fewer teeth than Arizona's 2010 "Show Me Your Papers" measure that was partially struck down by the U.S. Supreme Court. On the final day of the legislative session in May, tensions boiled over when Republican state Rep. Matt Rinaldi told Democrats that he had called federal immigration agents to report protesters in the Capitol who held signs saying they were illegally in the country. One Democratic legislator admitted pushing Rinaldi, who responded by telling one Democrat that he would "shoot him in self-defense." The Trump administration has made "sanctuary cities" a target. U.S. Attorney General Jeff Sessions has threatened to pull federal money from jurisdictions that hinder communication between local police and immigration authorities and has praised Texas' law.